These are notes from a short lecture given at Nottingham University on 28th November 2017. Click on the images to enlarge them. During the 17th and 18th centuries the rise of mercantile power, colonialism and a slave economy was associated with the development of the idea that “improvement” meant production growth and was an indicator of a new idea of progress. This was a core idea in Adam Smith’s book The Wealth of Nations. In it Smith described the production increase at the early stages of the industrial revolution as being the result of an increasing division of labour and specialisation – his famous example being the pin factory. However what really enabled the industrial revolution to take off was not just that production was being broken down into simplified specialised processes in factories but that this specialisation enabled mechanisation. Machines were being applied to production on a greater scale and these machines were powered. Their energy source was fossil fuels – coal fired steam engines began to overtake wind and water mills, sails, wood and the muscles of humans and work animals as the main energy and power sources. Later in the next century coal power was supplemented oil as a fuel source refined into petroleum and diesel. Later still natural gas became a fuel. The technologies of energy delivery evolved too. Gas was created from coal and piped across towns and cities. The fossil fuels, and later uranium 235, were used to generate electricity which could be distributed by power grids. It could be generated too by hydro power dams as well as by wind and solar. To get a sense of the scale of what happened over 250 years we can compare the amount of power that averagely fit human beings can generate in work processes to the amount of power generated each year by fossil fuels. If we ask someone to sit on a pedal generator and peddle all day and night they can generate is 3kWh p/d. 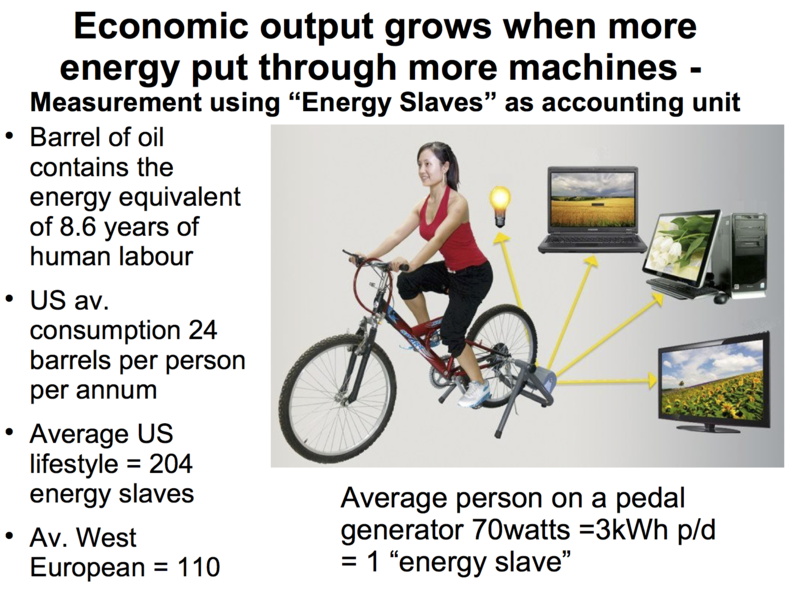 Let us call this unit of measurement the labour power of one “energy slave”. Measuring with these kind of units of account a barrel of oil contains the energy equivalent of 8.6 years of human labour. Since the per capita average consumption of oil for the USA is 24 barrels per person per annum we can say that the average US lifestyle requires 204 “energy slaves” and the average West European lifestyle requires requires 110. The energy is converted through machines which processes raw material into products, it powers transport vehicles of various kinds, it powers communications and information processing devices like the internet, it powers devices to regulate temperatures and other devices in the home that makes domestic labour quicker and more effective – vacuum cleaners, cookers, dishwashers and so on. Let’s use another measurement to get a sense of the scale of energy usage in the contemporary world – the cubic mile of oil. A cubic mile of oil is the amount of oil consumption that global economy is using every year. That’s just the oil – the other energy sources are mainly coal and natural gas with a small amount of biomass, nuclear, hydro electric, geothermal and wind and solar. 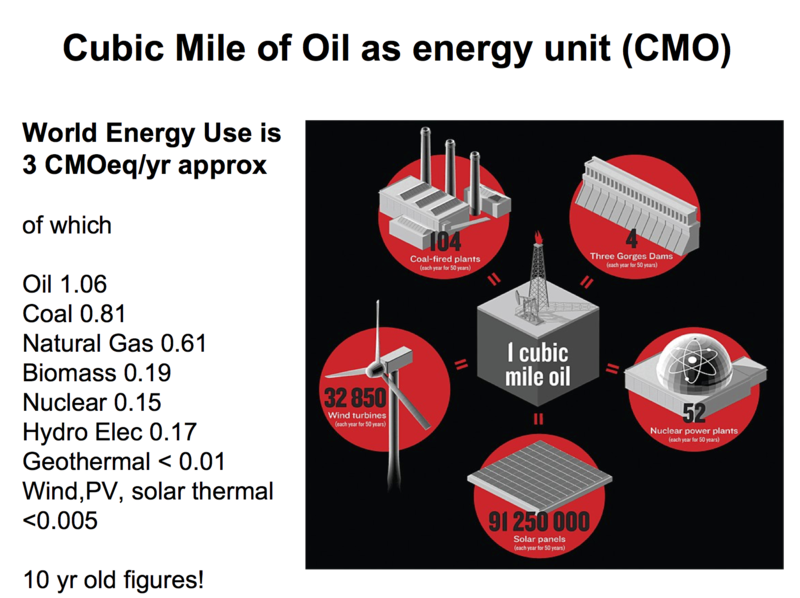 Oil 1.06 CMO; Coal 0.81CMO; Natural Gas 0.61CMO; Biomass 0.19CMO; Nuclear 0.15; Hydro Elec 0.17CMO; Geothermal < 0.01CCMO; Wind+PV+solar thermal <0.005CMO (The power point graphic image shows what would be needed to provide a substitute amount of energy equivalent to a CMO. For example building 4 X something of the scale of a Three Gorges Dams every year for 50 years @ 18gigawatts power. Or 32,850 turbines with a 70-100 metre blade span generating 1.65MW every year for 50 years. Or 91,250,000 x 2.1kW solar panel every year for 50 years….) I make no apologies for concentrating a talk about growth on the massive growth of the energy system. Mainstream economists typically concentrate on science, technology and innovation to explain economic growth – but virtually all these new innovations are new ways to use energy and it is the energy of coal, oil and gas that does the work. The economy grows essentially when more energy is put through more machines. Is continued growth and an industrial economy actually desirable and, a separate and different question, is this growth sustainable? Can growth continue? 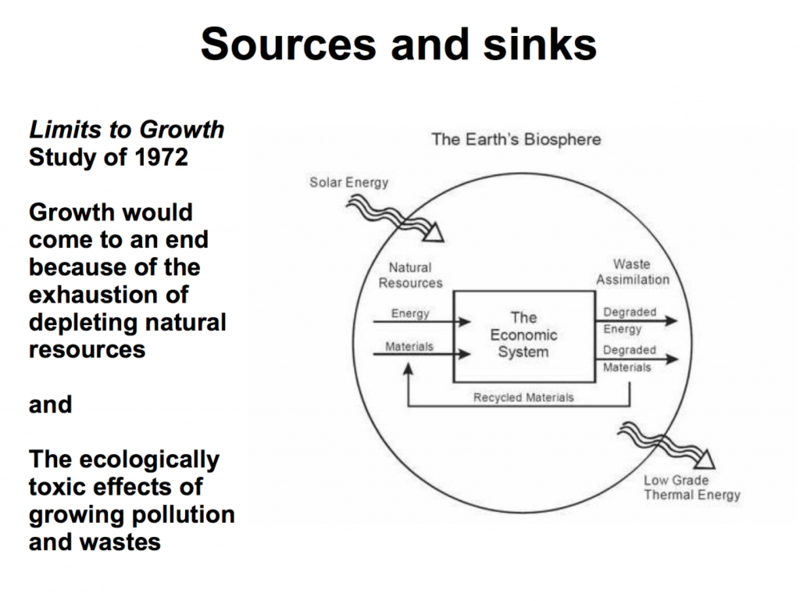 In the 1970s growing uneasiness about the ecologically destructive effects of the growth economy led a few economists and scientists who were sceptical that growth could continue for ever to look into this matter in more depth. In 1972 a study was carried out by a group of academics from the Massachusetts Instutute of Technology and published by the Club of Rome. The academics concluded that sometime in the coming century growth would inevitably come to an end. It would not be possible for the economy to grow for ever on a finite planet. Their argument was that growth would come to an end for two kinds of reasons which can be summarised as the exhaustion of(re)sources and the overwhelming of sinks. Economic activity takes resources from the ecological and planetary system – energy minerals, metals, building aggregates which are ultimately limited by the availability of geological deposits – and renewable natural supplies like wood, fish and so on. The natural (renewable) supplies can be regenerated but not if they are overharvested – which requires proper management of the resource. 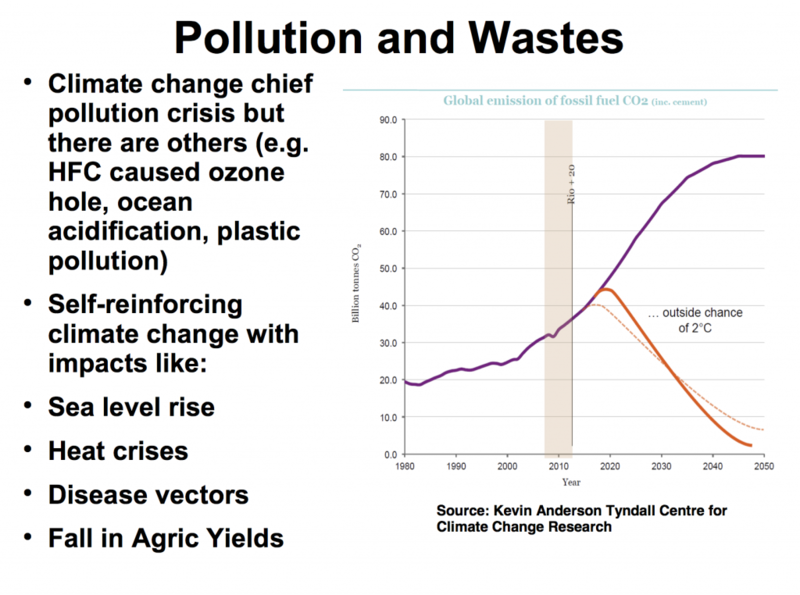 Economic activity also puts wastes and pollution back into the planetary system. This occurs during the production process itself and, later, when products are thrown away. The pollution and wastes can be absorbed by the planet at a certain scale – but if too much they become toxic and destructive. For example virtually all production processes that use energy generate CO2 and a variety of other greenhouse gases, while wastes like plastic are a serious threat to marine eco-systems. 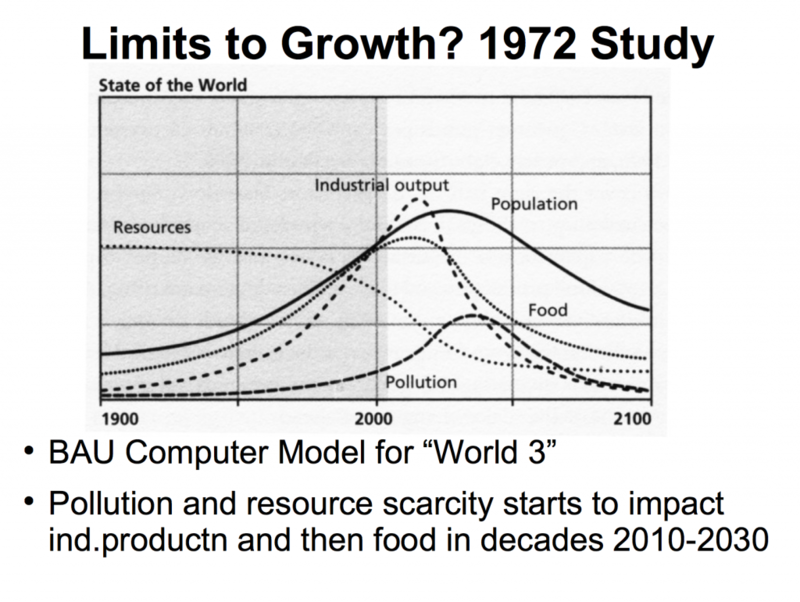 The diagram expresses the business as usual model of the MIT scientists – economic growth is shown as a growth of industrial production and as a growth in food which allowed the growth of population – however as these increase so too does pollution – while resources decline. The combination of the negative effects of two trends leads eventually to a downturn of industrial production in the early years of the 21st century (2010-2030). This would be followed by a rise in the death rate and a downturn in the birth rate – hence a fall in population. There is currently a fierce debate about whether these problems can be resolved – and there has been since the 1970s – from the very first time that the Limits to Growth book was published. At that time economists declared that the Limits to Growth authors had not understood how markets and technology worked and declared the study discredited. Nowadays, although a debate exists most mainstream economists and politicians seem to be barely, or not at all, aware of the issues and take for granted that growth can and should continue. In the last few years a few observers have noticed that growth in productivity is, in fact, slowing. They struggle to explain it. Belief in economic growth has some of the taken for granted features of a religious faith. On the one side there are those who are convinced that markets can be used to incentivise technology fixes – however, those of us who are not convinced that growth can continue try to draw attention to issues that show that the fixes are not affordable or acceptable in a variety for a variety of reasons and in a vaariety of ways. 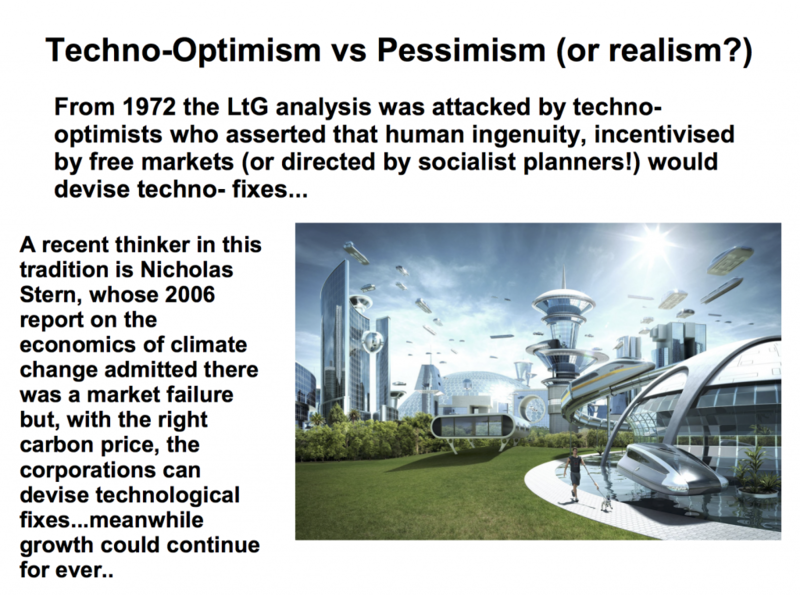 Typifying the techno optimists are economists like Nicholas Stern whose famous report of 2006 on the economics of climate change was all about how an appropriate carbon price was needed to incentivise the necessary technological changes. Without an appropriate carbon price to incentivise the needed technologies “growth itself would be threatened” – his ultimate nightmare. What the appropriate technological fixes are actually going to be are the subject of competition and debates between coalitions led by different industrial and corporate groups, academics and researchers and their respective PR advisers and lobbyists. Now let’s turn to why the 1972 Limits to Growth model does describe reasonably well what has happened. Although there have been many sources of environmental toxicity to water, land and atmosphere the main focus globally has been on emissions of CO2 and other greenhouse gases and the global climate crisis. But there are other problems too – like plastic pollution in the earth’s oceans for example. The graph from climate scientist Kevin Anderson shows the trend increase in greenhouse gas emissions – and compares it to how greenhouse gas emissions would have to fall to have an outside chance of global temperatures not rising by more than 2 degrees C above the pre-industrial level. If we now turn to the second trend – the exploitation of depletable resources and over extraction of renewable resources. Arguably this is the process that is happening fastest and is likely to have the biggest short term impacts. You will note that in the original LtG picture resources do not run out totally but they do get scarcer. There are always more resources there to be had but the cheap and easy to extract resources are used up first and it becomes more expensive to extract the later resources. In this respect the extra expense arises in money terms because there is extra expense in the amount of energy needed as depletion proceeds. 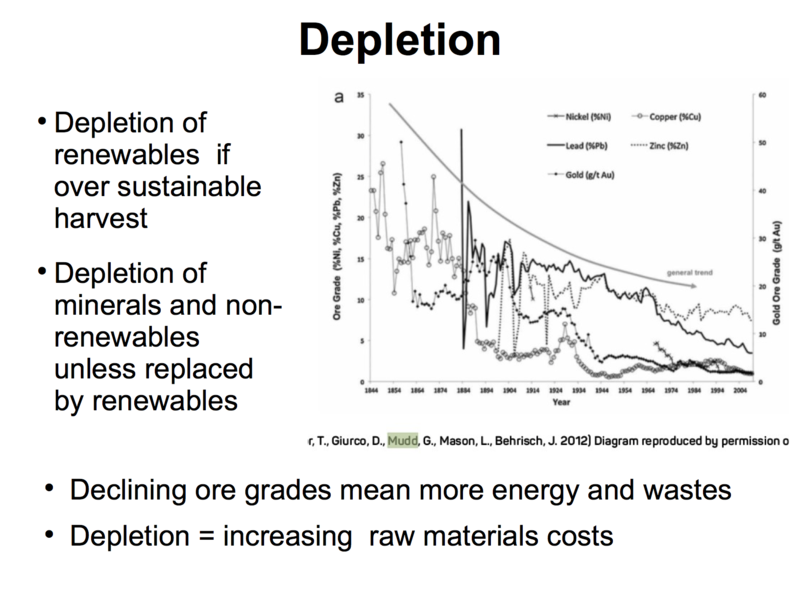 Take for example depletion of copper ores….humanity extracts 15 million tons of copper a year from ores that are only 0.5% copper, which means there are 3 billion tons of waste ore – even more than the total mass of concrete produced a year globally. Once humanity is down to 0.1% copper it will be necessary to shift 5 times the amount of waste – with a correspondingly 5 fold increase in the energy bill to do that. The same trend can be seen in the extraction of energy minerals – oil, natural gas and coal. As the easiest and cheapest to extract coal, oil and natural gas are used up so more energy and money is needed to extract what is left over – resources have to be got from smaller fields found in the Arctic, or in deep sea locations under thousands of metres of rock, or by blasting open unporous rock containing oil or gas with fracking, or by using hot water heated by natural gas to wash oil out of tar sands. Technologies exist to respond to a depleting resource but all using much more engineering, much more energy and cost much more in money too. Such technologies are sometimes called “extreme energy” because their environmental and public health impacts are greater too. So there are technical and engineering options – but are they affordable and are they acceptable? On current trends there is an argument that the oil and gas sector is heading towards bankruptcy. If it does go bankrupt this will in all probability pull down the financial sector too. At the time that the LtG study came out in 1972 the authors of the study were attacked for not understanding how markets work – essentially it was assumed by mainstream economists that if resources became scarce then people would forsee this and free markets could incentivise sorting out the problems. Prices would rise, more would be produced and less would be demanded. Problem solved. 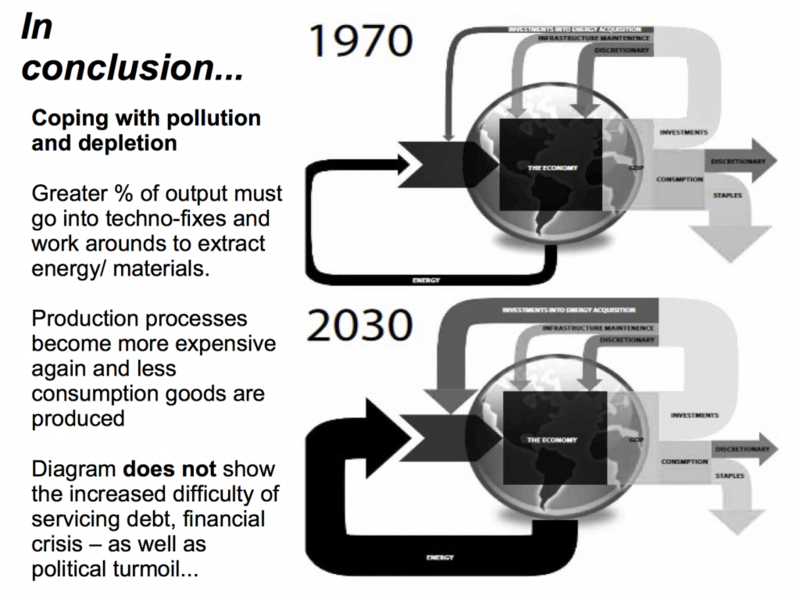 Pollution problems could be sorted by market mechanisms too. It occurred to none of these economists that there might be a Catch 22 of the type described. 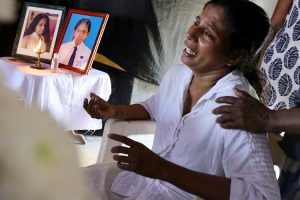 However action on pollution problems in general and climate change in particular has been blocked by the lobbying and PR power of the fossil fuel companies whose power in the state apparatus of various countries is unparalleled. Meanwhile the market has incentivised new technologies of extraction but, as explained, these are trapped in a catch 22 of unaffordability. The fossil fuel industry itself promotes fracking for shale gas and shale oil. This is its solution for depleting conventional supplies. The industry also likes to argue that gas is a low carbon fuel and thus makes a transitional contribution to addressing the climate crisis. However this is an argument that ignores or misrepresents the seriousness of methane leakage by the shale gas industry and its distribution infrastructure, not to mention many other public health and environmental consequences of shale gas. Leaving aside these so called external costs most of the US shale industry in the US has not covered its internal costs. It has thus made losses and built up debt since 2009. It would not have expanded so far without the low interest rates brought about by quantitative easing. Another techno fix for the fossil fuel industry is the idea of carbon capture and storage – burning the fossil fuels but capturing the CO2, liquifying it and pumping it underground. This is an idea likely to be even less popular than fracking. 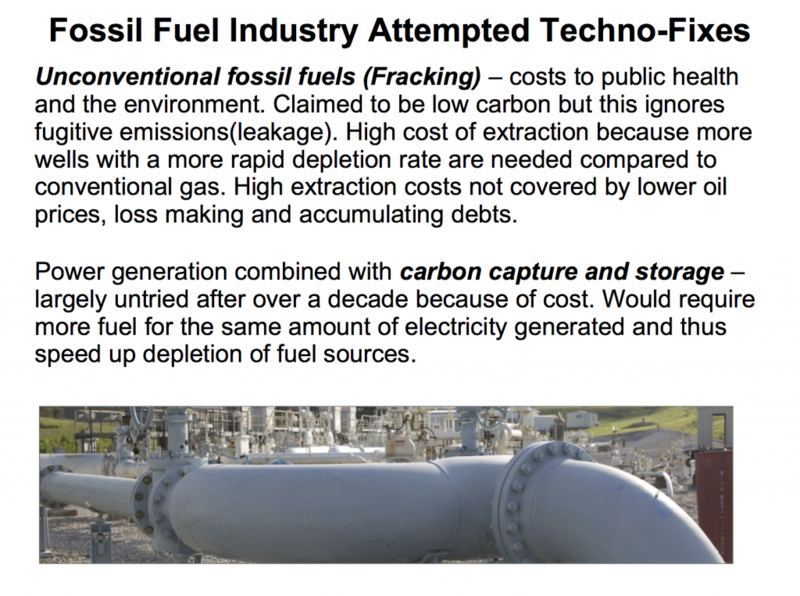 It’s another techno fix that raises costs – this time of fossil fuel power generation. What’s more it will actually speed up depletion as it uses more fossil fuels to get the same amount of electricity. Coal plants that capture and store 90% of their carbon emissions cost nearly two-thirds more than an equivalent coal plant without CCS to produce the same amount of electricity. The costs are in the creation and operation of the equipment needed to capture, pump and store CO2 underground. Another purported solution to fossil fuel depletion and to fossil fuels as climate destroyers is the use of biomass and biomass burned directly in power stations or turned into liquid biofuels for uses in vehicles. There is a spurious argument that biomass is zero carbon and can be taken without displacing food production and/or displacing existing cultivating communities who are using land that the agro-energy industry needs to get hold of in order to plant up with energy crops. 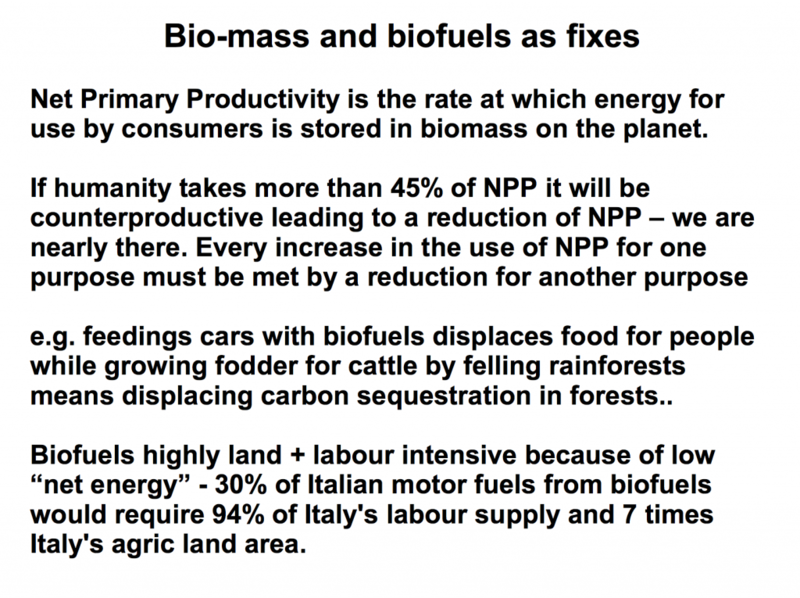 What needs to be appreciated here is that there is an upper limit on the percentage of biomass growing on the planet that humanity can use without by being counter-productive and reducing the availability of what is called “net primary production” (NPP). Since humanity is almost at that limit (45% of biomass) this means that increasing development of agro energy means displacing other uses – like the capacity of untouched forests to act as carbon sinks, or displacing food growing for fuel and driving up food prices or making fibre crops for textiles scarcer or reducing wood as a building material. Then there are the wind and solar power sectors which most of the greens endorse and promote. I do too but its necessary to be honest and acknowledge the problems. They are not a panacea. Many people reassure themselves that renewable energy like wind and solar will come to the rescue but there is a fierce debate about how big their potential is. 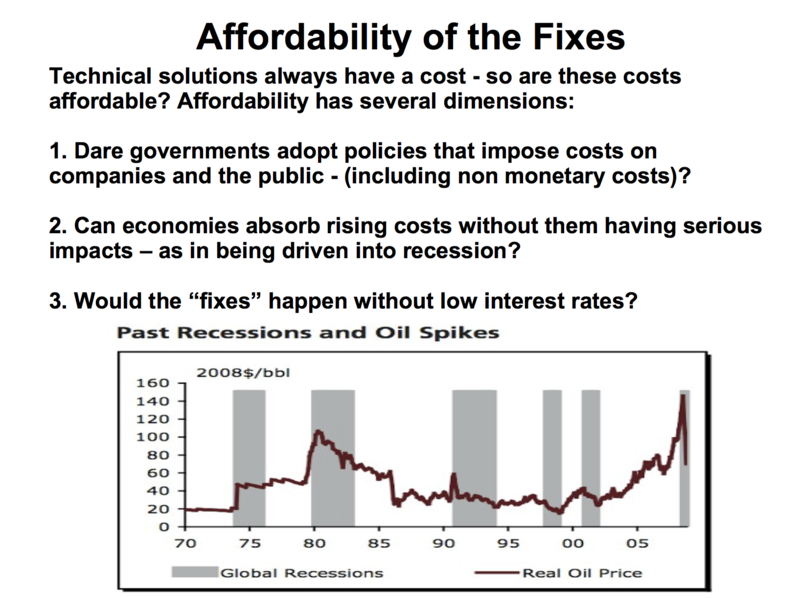 The problem is the same – one of affordability. Wind, solar and other renewable energy technologies like wave or tidal power are all technical possibilities but they are all expensive to develop particularly when you also add in the costs of dealing with intermittency – the fact that the sun is only shining part of the time and with varying degrees of intensity and the wind is also variable and in an even less predictable way than solar. In London, UK, which is a moderately suitable location for solar power, a solar panel produces on average 10 times less energy in December than in June. This variation can extend as far as producing 65 times less energy on a heavy overcast day in December at 10 am than on a sunny day in June at noon. Under fluctuating cloud cover, the output of multi-megawatt PV power plants in the Southwest USA was reported to have variations of roughly 50% in a 30 to 90 second timeframe and around 70% in a timeframe of 5 to 10 minutes. There are, of course, technical ways to balance intermittent energy sources like solar and wind – for example with gas fired power stations fired up when the wind does not blow and the sun does not shine. But gas is depleting and it defeats the goal of a fossil fuel free energy system to have a gas powered – or biomass fired back-up. Having two parallel energy systems – a gas and/or a biomass fired system on permanent standby and the renewable energy system to be used when wind and sun are available would also be very expensive. 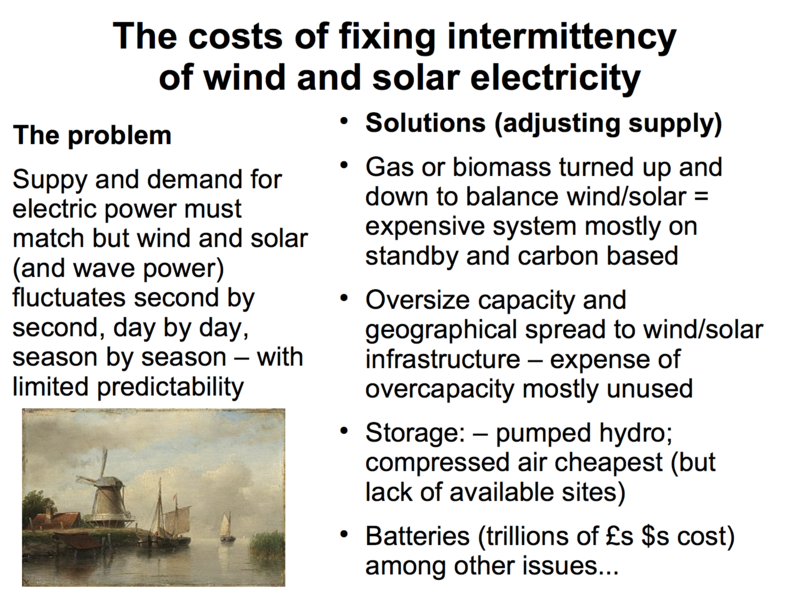 The other solutions for intermittency are expensive too – overdeveloping the renewable infrastructure so that it has a wide geographical spread with connections so at least the the wind and sun are available from somewhere. The third option is trying to develop energy storage capacities. The cheapest is using energy to pump water up to an elevated reservoir where it can be stored and tapped later as hydro power. Alternatively energy can be stored in compressed air or, finally, as in utility scale battery stores. Technical possibilities do exist for energy storage – but for a few minutes or hours locally – not for storing energy from the summer to the winter to cover weeks of cold winter days and nights. It is important to realise too that scientists and technologists have been trying to improve batteries now for just under 200 years. There has been some improvement but not major breakthroughs. Above all energy storage is expensive. An American study asked what it would cost to store 24 hours of the US electricity consumption with a variety of energy storage techniques. The cheapest are pumped hydro compressed air but there are few places to put them. The next are sodium sulfur (NaS) and lithium ion. To get a sense of the cost take into account that US GDP is 17 trillion per annum. With NaS a 24 hour power store would cost $40 trillion, cover an area of 923 square miles and weigh 450 million tonnes. With lithium ion it would cost nearly $12 trillion and with lead acid $8.3 trillion. In each case the mining extraction of the chemical element which stores the energy would have to increase massively. For an individual technology to reach 12 hours of capacity, annual production by mass will need to double for lead, triple for lithium, and increase by a factor of 10 or more for cobalt and vanadium. This will drive up the price of these commodities. All of these are attempting to manipulate energy supply to match when there is a demand for it. But what about doing it the other way round – adapting the use of energy to when the wind is blowing and sun is shining. What about using electricity when it is available? Techno-optimists have ideas about smart grids which turn the fridge off when the electricity is not there/too expensive. This would be part of the internet of things. Again it is a high tech solution that does not take into account that the internet itself uses a great deal of electricity in its production and operation. It too would be very expensive in money and grid development and in the bandwith that would be required to have all electrical appliances and items networked and communicating with each other. Nevertheless doing without when the energy is not there will probably need to be the major part of the response. It the UK it could meet its energy needs most days of the year but on a random basis it would be without electric power for perhaps 65 days a year, according to the authors of Zero Carbon Britain. This diagram by Charles Hall (and reproduced in my book Credo) can be thought of as illustrating the idea of the techno-fix transition if it were possible. It shows two diagrams of the economy and energy system in 1970 and 2030. There are no figures – the point of the pictures are to show the way that more energy is extracted out of the global system and then used in the global economic process between the two dates – and to show the different proportions in which the global economic output is divided up. Although more energy is being used at the later date a much higher proportion of the output of the society has to take the form of investment goods – machinery, equipment and infrastructure – with a smaller proportion in the form of final consumer goods. The higher machinery, equipment and infrastructure has to be applied to extracting energy because more resources are needed for pollution and waste control, for reducing greenhouse gases, for coping with the depletion of energy minerals, for investing in energy sources like solar or biofuels that give a very low energy return on energy invested and to cope with intermittency. In other words – the higher investment in energy does not mean higher output of energy – it is necessary to cope with the declining efficiency, declining returns of the energy system past the limits to growth. Since a large proportion of total production is being devoted to investment goods to cope with depletion and pollution, less is left over for consumer goods and particularly for discretionary consumer goods – luxuries, the goodies of a consumer society. But what consequences would this have? As people have to pay more for clean energy they would have less for the knick-knacks on sale in the luxury shops in airport lounges, if indeed people could any longer afford to fly. The argument here is that this would be crushing to a consumer society and there would be a permanent recession in the consumer goods sectors – indeed there would be a political crisis in such a society. One point should be made – someone asked after my lecture whether it would be possible to institute Keynesian demand creation measures to keep such a society operational. A good question – but it is worth remembering that the choice of 1970 and 2030 were just two notional illustrative dates. A third picture for 2060 and a fourth for 2090 could be drawn in which the trends continued – with a further squeeze on available consumer goods. Clearly Keynesian demand management would not solve that – some other response would be needed. This is a story where only part of the narrative has been told – partly because the lecture was itself only 40 minutes long. Any description of the world is always lacking elements, some known but left out for reasons of time, some not known anyway. (1) inequality – most of the growth of production and income over 250 years has gone to the richest 10% of the (“developed”) world. There is now an issue of how much the rich or the poor absorb the losses of production after growth turns into degrowth. (2) the scope for social and behavioural changes or “none technological changes” – changes in institutions like a revival of commons, changes in society like sharing more and making do with less (rationing, resource centres and centres based on the library principle, community agriculture and gardens, mending and repair help, co-housing, public transport infrastructures, and behavioural change). Brian Davey 30th November 2017. Lecture notes of 28th Nov slightly rewritten. overshoot: growth beyond an area’s carrying capacity, leading to crash: die-off. Most people to whom I speak do not believe these definitions apply to us. Our species, they say, is way too clever to cause a crash in our own population.